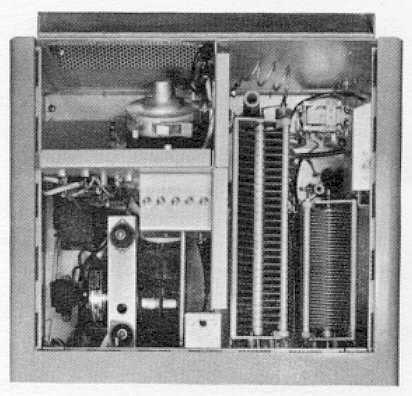 The 3OS-1 is a completely self-contained, single tube, grounded grid linear amplifier. It utilizes the commercially popular Eimac 4CXI000A tube. The 30S-1 Linear Amplifier provides the SSB and CW station with full legal input power for SSB (1 kw average) or 1 kw input for CW transmission. 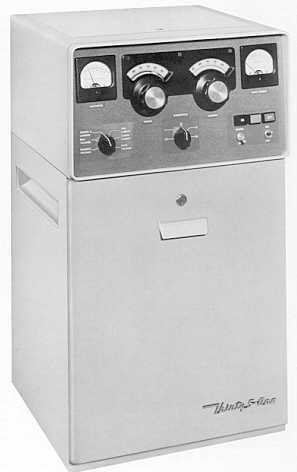 It requires 70-100 watts driving power (supplied by the Collins 32S-3A Transmitter or KWM-2A Transceiver). All the 30S-1 controls are easily accessible on the front panel. This front panel design allows you to tune the 30S-1 swiftly, surely, and easily. With the push of a button you can switch instantly from the 100 watt power level of your transmitter to the full kilowatt output of the 30S-1; yet you retain high linearity and a clean signal. The 30S-1 can also be tuned to frequencies outside of the amateur bands. Automatic load control voltage from the 30S-1 is fed back to the transmitter, assuring you of maximum talking power without overdriving and distortion. Collins' automatic load control, in combination with inverse feed back, is a major design feature in the 30S-1 which gives more talk power with a cleaner signal than any other linear amplifier in the amateur field. A multimeter on the front panel is switchable to read tuning and loading, bias voltage, filament current, grid current, screen current, and plate voltage. Correct tuning and loading is quick and easy on the 30S-1. With the multimeter selector switch in the Tuning and Loading position, comparator circuitry allows adjustment of the P.A. tuning and loading controls to zero the meter. Conservatively designed around the highest quality components, the 30S-1 is rated for continuous duty on SSB and a 50% duty cycle on RTTY and slow-scan TV. SSB, CW, RTTY, or SSTV. Attended operation SSB continuous; CW 50% duty cycle. 115 vac or 230 vac, 50-60 Hz single phase, 2000 watts. Nominal average, 1000 watts on SSB; 1000 watts on CW. (28.0 MHz): 20.0 - 30.0 MHz. Second harmonic -40 db; all others at least 50 db down. Third order distortion at 1000 watts PEP output 30 db below signal. Variable; 50 ohms nominal, unbalanced with not more than 2:1 SWR. 17" W, 30 5/8" H, 18 3/4" D (43.18 cm W, 77.79 cm H, 47.63 cm D).